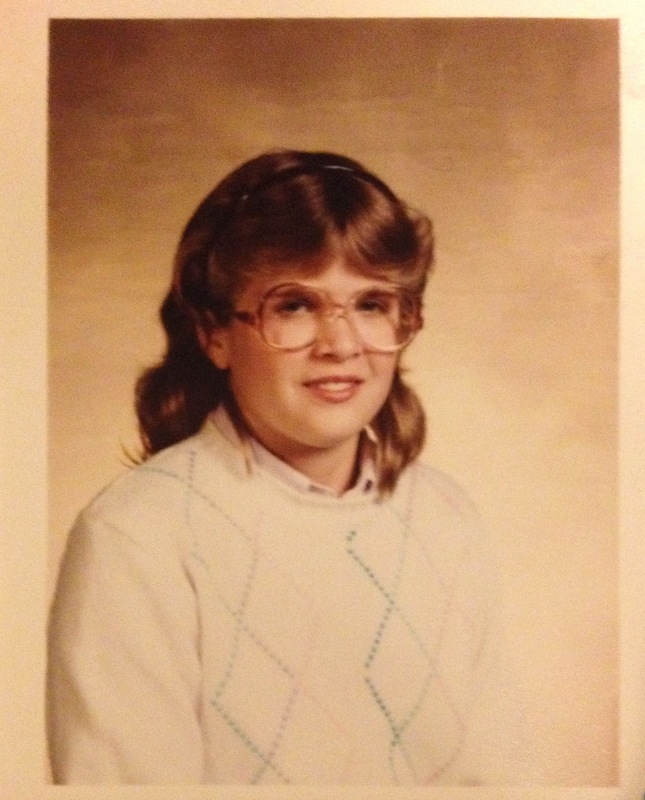 My school photo from 1983 – 7th grade. I first got glasses when I was 12 years old, in the seventh grade. I hated them from the get-go, which I know is hard to imagine, given their ginormous 80s awesomeness. I didn’t really wear them as much as I should and seem to have avoided wearing them for photographs. The picture at right, in fact, is the only school photo of mine where I have them on. At some point within the firs year or so of having glasses, I somehow got my parents to agree to let me get contact lenses – on the seemingly impossible condition that I pay for them myself. (Soft lenses were fairly new in the mid-1980s and were very expensive.) I babysat a lot. And delivered a lot of papers. And shelved countless books at the library. And had my first pair of contacts at 15. From that point on, I never wore glasses regularly again until about a year and a half ago, when I realized that what I had taken for an allergy-induced bout of itchy eyes had been going on for six months – far outlasting allergy season. Over the course of six months I tried wearing my contacts less and less, switching the solutions I was using, changing out my lenses more frequently… all to no avail. After 25 years of wearing contacts, my eyes were just done. I went back to wearing glasses full time last spring, and have hated it as much as an adult as I did as a 12-year-old. From a vanity perspective, I don’t like how I look in glasses, but much more importantly, I don’t like the way I see. After so many years in contacts, with full peripheral vision, being allotted two tiny rectangles of clear sight just doesn’t work for me. And so, tomorrow I go under the knife – well, laser – for LASIK surgery to permanently fix my eyes. I am kinda nervous about the procedure itself, but am so excited by the idea that I’ll wake up Friday morning and be able to see the clock from my bed. The era where I can’t see squat without help will finally be over. I won’t miss it. How in the world did your plan to do this not come up on our NYC trip? Hah! I think we spent all our time discussing our eerily similar work lives. Excited for you…and nervous. Keep us posted. Hugs! Good luck tomorrow! I’m rooting for an easy, pain-free process! I echo Eileen and Sptite. Hugging You. Love ya!!! Right. They are the “ginormous 80s awesomeness” I mention in the beginning. My current glasses are tiny rectangles, however. I know several people who have had this done. Every one of them is completely satisfied. Minimal discomfort for the payoff. We’re glad you’re FINALLY getting this done!!! Update us? How I wish I’d taken your leap years ago. Good Luck. Hugs.